In my four undergraduate years of college, I have had eleven different and wonderful roommates, I have frequented three dining hall cafeterias, and I have cooked in two different small college kitchens. Throughout these experiences, I have gotten the chance to observe…a lot. I’ve gotten frustrated with the girl that only eats soup for lunch because it just fills her up so fast! On spring break trips to the luxurious Panama City Beach, Florida, I’ve watched my friends get by on a loaf of bread and PB&J for a week while I had a $80 grocery bill and was whipping up food left and right just to get rid of it. I’ve had housemates declare that they themselves would never have thought up a certain concoction I put together for dinner one evening. Because you frequent this site, I would imagine that you have been in a similar position at least once, which is why I’ve put together the foolproof guide: How-To Teach Your Roommate(s) to Cook. Choose the Battle. I’ve learned that there’s a big difference between getting your roommates to cook and actually teaching your roommates to cook. Many of your friends are quite capable of exhibiting some cooking talent, they just never actually take the initiative to try it. Create an Opportunity. “I don’t have time” is probably the top reason you’ll hear from your roommates about why they don’t cook. Fix this! Create a time for you and your roommates, and even extra friends or guests to eat together, sharing the cooking responsibilities. Make it fun. Last year I lived in a house with eight other girls, and we made Sunday nights our time to eat together. We started out small, each just taking on our own item to cook for the meal, and we gradually added more components: sign-up sheets (table setter, water pourer, place card maker, etc. ), themes (black and white, murder mystery, occupations), and a guest each week (mutually agreed upon by all the housemates). Eventually, each person would gather recipes each week (from moms, friends, internet sites, etc), and we’d create a meal! Take Risks. Unlike baking, which is precise, and not for me whatsoever (unless you want burnt cinnamon rolls or gooey brownies…though I’m dying to take a whack at this Brownie-Mousse au Chocolat), cooking is usually forgiving. Teach your roommate that sometimes cooking involves experimenting–throwing caution to the wind and trusting your instincts. If you think flavors sound good together, chances are, they’ll taste that way too. Trying out what may seemed like hair-brained ideas can lead you to some of your best dishes yet. Develop tastes. Never trust someone who hasn’t tasted their dish at every step along the way. Urge your friends to develop their own tastes: mild or sharp, salty or sweet, basil or parsley. Once you get a feel for the tastes you like and dislike, it’s easy to incorporate those tastes into your cooking experiences. Practice. I could have gone over the most technical way of sautéing or the exact amount of time you should hard boil an egg, but the truth is that cooking is more of an art than a science, and the more you practice, the better you’ll be. (You can get some good Cooking 101 tips on this site, though, if that’s what you’re after.) So grab your roommate, turn on some tunes, and head to the kitchen. The time is now! 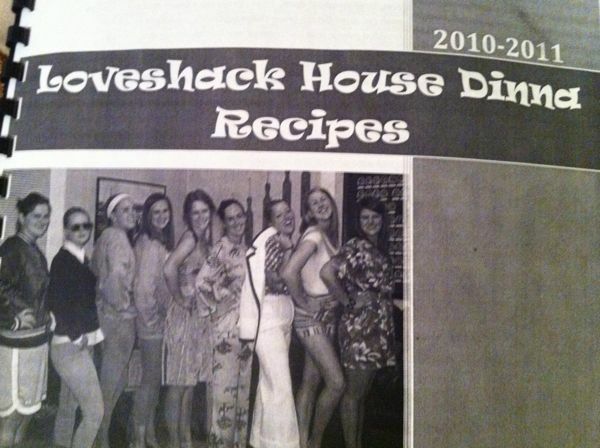 Shannon Kelley is currently pursuing a graduate degree in education at Truman State University in Kirksville, MO, though she’s not sure if she can survive without the Loveshack house dinners of yesteryear described in this post. Awesome job, Shannon! I still remember sitting next to you eating PB sandwiches (and bread and bbq sauce!) in PCB while you dined on a delicious homemade taco meal! But last night I made dinner for my family which involved neither peanut butter nor bbq sauce! Look at me go! You’re articles will surely help me. Thanks, Ellen! So proud of you!